The Large Black breed was developed from the black pigs of Devon and Cornwall and the European pigs found in the East Anglia area in England. In the early 1900s the Large Black was used for the production of pork in outdoor operations. Its coat colour makes it tolerant of sunburn, and its hardiness and grazing ability make it an efficient meat producer. Large Blacks are also known for their mothering ability, milk capacity and prolificacy. The breed is known for its good mothering ability. Early selection was toward the bacon type, and now the breed is characterized by great length and depth of body. The heavy drooped ear is also a characteristic of the breed. In fact, the ears are so large that they cover much of the face and seem to obstruct their sight. The disadvantages of the breed are that they do not have the growth rate and early maturing characteristics of the commercial breeds, and the black pigmentation of the skin is not removed by processing. The Large Black was first imported into NZ in the early 1900s, and was suited to easy-care production systems for the production of bacon. 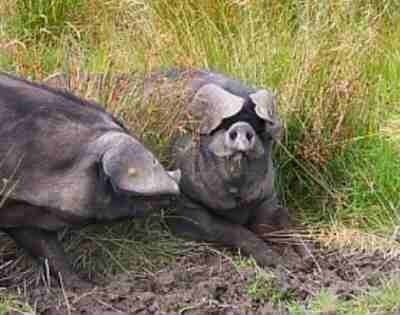 Worldwide the numbers of large Black pigs is low, and they are considered a rare breed in many countries. 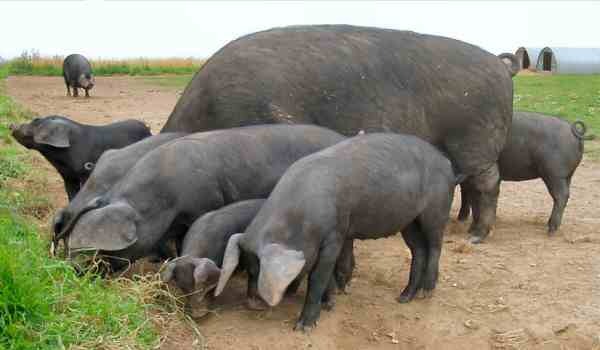 They are a relatively easy-care pig, and their hardiness and docile nature make them suitable for lifestyle blocks. Go to Large Black Standard of Excellence.